I usually make this to go with sticky salmon, and use the fish marinade to flavour and cook the beans. You can adapt this recipe to whatever vegetables you might have – from broccoli to Chinese greens to mange tout. If you’re using the salmon marinade, there’s no need to add additional soy sauce, sesame seeds or chili here. Place a wok over a medium heat, and add a splash of sesame oil. When it’s hot, chuck in your onions and stir fry until the edges start to turn brown. Add the garlic, and keep everything moving until it becomes fragrant. Be careful not to burn the garlic though! Add the sesame seeds and chilli, and stir a couple of times. 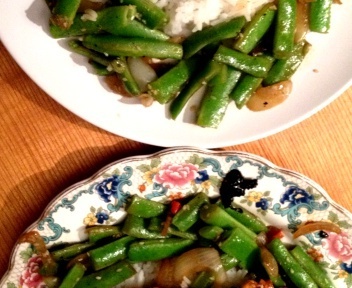 Throw in the runner beans, mix with the other ingredients then add the soy sauce (if you’re using leftover marinade, add it at this point instead of soy sauce). Allow everything to stir fry for another few minutes, stirring every now and again, then remove from the heat and serve. The beans should still be crunchy.